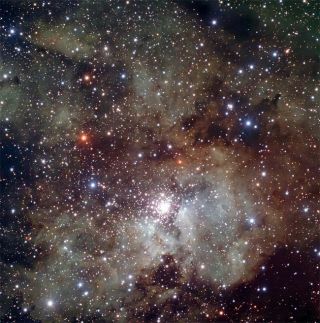 A snapshot of the nearby starburst region NGC 3603 taken by the Very Large Telescope in Chile. A new panorama of a cosmic nebula offers an up-close glimpseof baby stars being born. The nebula, dubbed NGC 3603, is called a starburst regionbecause stars are coming into being in feverish bursts of activity. It liesabout 22,000 light-years away from the sun, making it the closest region of thekind known in our galaxy. This near view offers astronomers a relatively localtest bed for studying intense star formation processes that are usually hard toobserve in detail because of their great distance from us. The new view was captured by the European SouthernObservatory's Very Large Telescope in the Atacama desert of Chile. The cosmic panoramadisplays the rich texture of the surrounding clouds of gas and dust in thearea, with many of the hot newborn stars dotting the scene with blue light. This nebula is also home to the mostmassive star ever to be ?weighed? so far. This behemoth, part of a binarysystem called A1, is estimated to be roughly 116 times the mass of the sun. NGC 3603 owes its shape to the intense light and windscoming from the young, massive stars that push out against the curtains of gasand clouds. The central cluster of stars inside the nebula harbors thousands ofstars of all sorts: the majority have masses similar to or less than that ofour sun, but most spectacular are several of the very massive stars that areclose to the end of their lives. Several blue supergiant stars crowd into a volume of lessthan a cubic light-year, along with three so-called Wolf-Rayetstars ? extremely bright and massive stars that are ejecting vast amounts ofmaterial before finishing off in glorious explosions known as supernovae.